Increased movement costs of BUA and Fortification. The former is to make couriers move along roads inside BUA. Sketching out game objects- this is the set of objects used to hold pretty much everything makes up a "game". There are a lot of these so I'm currently kind of chipping away at the mountain roughing out rock for my statue. Lots of pieces of rock are flying around and it's a huge mess. But you need to start from somewhere. 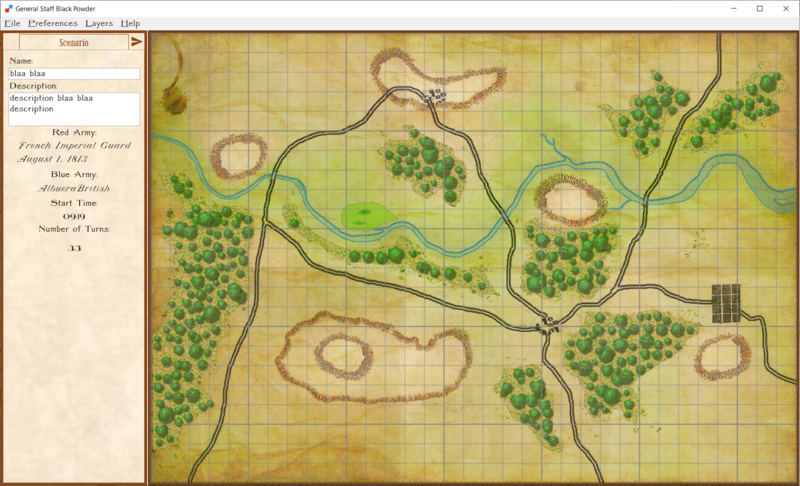 Picking a scenario for a new game now actually has some noticeable effect. 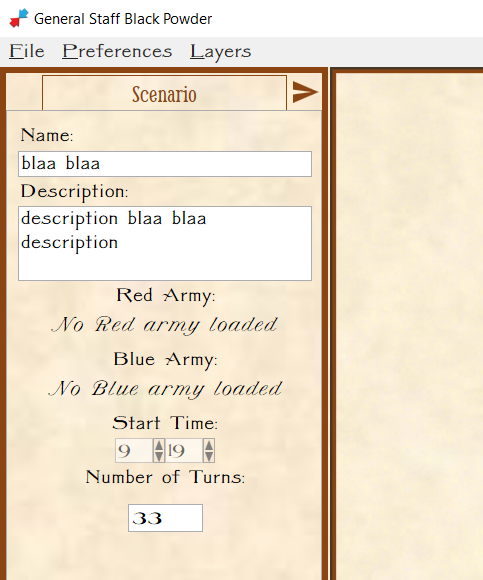 Click the button and you get to see the scenario name and description set, so far. Most noticeable effect is that new game now loads the map. A unit "on the board" and in action becomes a Piece which additional properties such as location. A PieceView is the piece of UI which has the circle that can "light up", the triangle indicates facing and the symbols representing unit formation and type. Adding message to indicate the ui is busy if the user ignores the spinner and tries to save. Warning when saving scenario to tell you if there's an orphaned unit - one whose CO is not in the scenario. This doesn't stop you saving the scenario - you might only be part way through building the thing and want to head off out or something. Which turned out to be rather more complicated than I was thinking. I can't "just" re-use code out the scenario editor. Partly because you don't have to use all of an army in a scenario. There are two labels, one above and one below the plaque for a place. The plaque is hidden when the points are 0. The bottom one is usually hidden. When the place is within a certain distance of the top of the map, the top label is hidden and the bottom one shown instead. This is the simple mechanism used to stop labels running off the map. Upped from 30px to 60px. More work on Pieces - something to show you. Added OOB structure to Units tab. 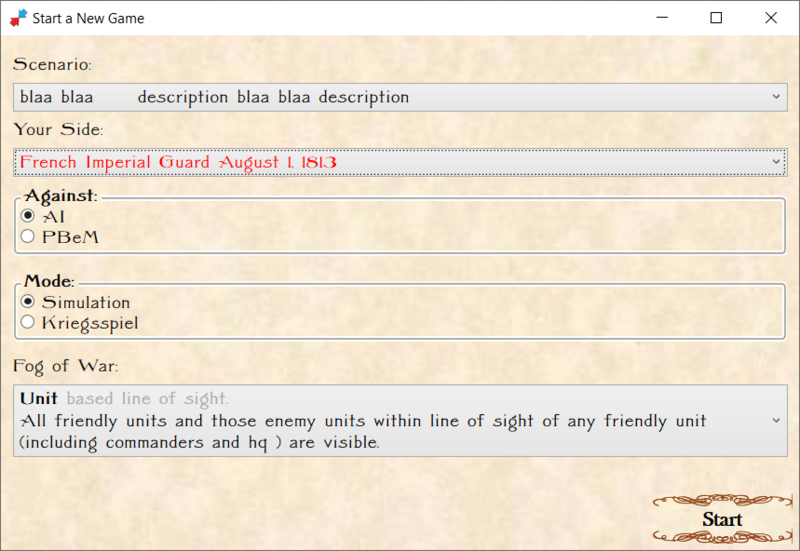 This first iteration is still very much a prototype EG which army is the player's is still hard coded. I need to implement the player0 = which army and player1 = other army and a way to switch which is the current player. Along with pretty much everything like everything to be input and saved per turn like orders and results. Warn user when closing app with unsaved changes. Similar to the army and map editors. Refactor of user message and busy indicator into re-usable common control. Made the line formation icons square. 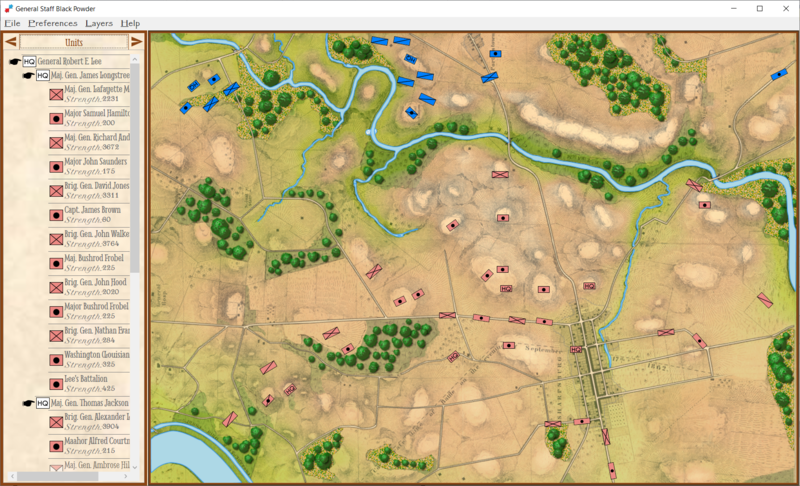 Unit type width multipliers are now no longer applied to kriegsspiel line icons. Added mechanism tracks which the "current" side is. Because ( naturally ) as you play the game you should only be able to order your own units about, see what your entire army contains etc etc. Add "second" army's pieces to board. Clear old pieces when starting a new game.